CAR/RXR heterodimers bind a variety of hormone response elements and activate transcription in the absence of added ligands. This constitutive activity of murine CAR can be inhibited by the inverse agonist ligand androstanol or increased by the agonist TCPOBOP. RXR agonists activate some RXR heterodimer complexes, which are termed permissive, while other non-permissive complexes are not responsive to such ligands. Direct protein-protein interaction studies demonstrate that the RXR agonist 9-cis-RA increases interaction of CAR/RXR heterodimers with the coactivator SRC-3, but also inhibits the ability of TCPOBOP to increase and androstanol to decrease coactivator binding. CAR transactivation of a response element with a five nucleotide spacer (DR-5) is unaffected by 9-cis-RA or the synthetic RXR agonist LG1069. In agreement with the inhibitory effect observed in vitro, these rexinoids block both the TCPOBOP mediated transactivation of this element and the androstanol dependent inhibition. 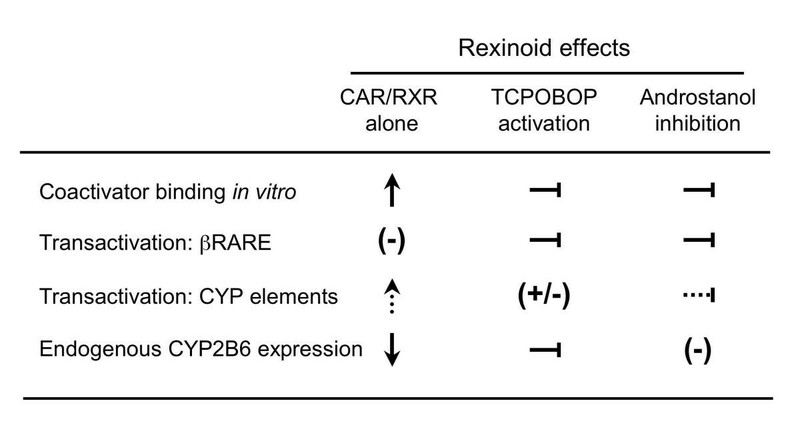 In contrast, CAR transactivation of other response elements is increased by rexinoids. Stable expression of CAR in a HepG2 derived cell line increases expression of the endogenous CAR target CYP2B6. This expression is further increased by TCPOBOP but decreased by either androstanol or LG1069, and LG1069 blocks the stimulatory effect of TCPOBOP but not the inhibitory effect of androstanol. 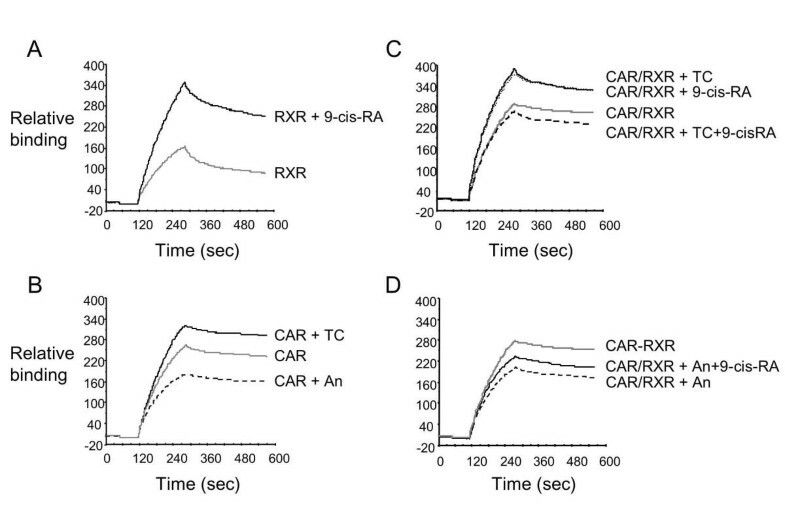 We conclude that CAR/RXR heterodimers are neither strictly permissive nor non-permissive for RXR signaling. Instead, rexinoids have distinct effects in different contexts. These results expand the potential regulatory mechanisms of rexinoids and suggest that such compounds may have complex and variable effects on xenobiotic responses. At least one third of the 48 human members of the nuclear hormone receptor superfamily function as heterodimers with the Retinoid X Receptors, (RXRs, NR2B1-3) . Some, but not all of these heterodimers can be directly activated by RXR agonists, called rexinoids, which include the endogenous ligand 9-cis-retinoic acid (9-cis-RA) and a number of synthetic compounds. The rexinoid responsive complexes are referred to as permissive and include the Peroxisome Proliferator Activated Receptor (PPAR) and the Farnesoid X Receptor (FXR) heterodimers; the Retinoic Acid Receptor (RAR), and Thyroid Hormone Receptor (TR) heterodimers are non-permissive [2–7]. The xenobiotic receptor CAR (NR1I3) [8, 9] is one of several RXR heterodimers that has not been assigned to either category. Initial results showed that CAR is an apparently constitutive transactivator able to activate gene expression in the absence of exogenously added ligands [8, 9]. The first CAR ligands identified, androstanol and androstenol, are inverse agonists that block this constitutive transactivation . More recently, it has been found that CAR mediates the characteristic response of a subset of drug metabolizing enzymes to a variety of structurally unrelated foreign compounds . These xenobiotic activators are referred to as "phenobarbital (PB) – like," based on the prototypic effects of the anti-epileptic agent on drug metabolism [12–14]. The most potent activator of murine CAR is the high affinity agonist ligand TCPOBOP (1,4-bis [2-(3,5-dichloropyridyloxy)]benzene) [15, 16]. The effects of specific RXR ligands on the CAR/RXR heterodimer have not been characterized, although high concentrations of both 9-cis-RA and all-trans retinoic acid have been reported to block PB induction of the CAR targets CYP2B1 and CYP2B2 in primary rat hepatocytes . In addition, a recent report suggests that both compounds decrease TCPOBOP-dependent CAR transactivation . In both cases, these effects were primarily attributed to sequestration of limiting amounts of RXR into ligand-dependent homodimers or heterodimers with other receptors. We have used several approaches to specifically examine the responsiveness of the CAR/RXR heterodimer to rexinoids. Unexpectedly, different responses were observed using different methods. Direct biochemical measurements demonstrate that rexinoids can induce coactivator binding, but can also inhibit the effects of CAR agonist and inverse agonist ligands. In transient transfections, the presence of RXR ligands can also inhibit the effects of these CAR ligands. However, different CAR/RXR heterodimer binding sites show distinct responses to RXR activation. Overall, these results significantly increase the potential complexity of the response of RXR heterodimers to RXR ligands and suggest a potential modulatory effect of rexinoids on xenobiotic responses. Initial functional results suggested that transactivation by CAR/RXR heterodimers is not affected by RXR ligands, including 9-cis-RA or synthetic rexinoids, indicating that CAR is a non-permissive RXR partner. However, gel shift studies indicated that the mobility of the CAR/RXR complex bound to a DR-5 element is increased by the presence of 9-cis RA, suggesting that the RXR ligand can bind to the CAR/RXR heterodimer. An increase in the mobility of the CAR/RXR complex was also observed in the presence of TCPOBOP or androstanol, alone or in combination with 9-cis RA (data not shown). To test the effects of rexinoids on coactivator binding in a defined biochemical system, surface plasmon resonance was used to characterize the effects of the various ligands on binding of CAR, RXR and CAR/RXR heterodimers to SRC-3 (also known as ACTR, p/CIP, RAC3, AIB1, TRAM-1), an effective coactivator for CAR and many other members of the nuclear receptor superfamily. As expected, 9-cis-RA stimulated coactivator binding to RXR alone, and the basal interaction of CAR with SRC-3 was enhanced by TCPOBOP and decreased by androstanol (Fig. 1A,1B). The interaction of SRC-3 with the preformed and characterized CAR/RXR heterodimer complex was increased by either TCPOBOP or 9-cis-RA (Fig. 1C). Strikingly, however, coactivator binding to the heterodimer complex was decreased below the basal level in the presence of both ligands. In addition, SRC-3 binding to the heterodimer was decreased by androstanol and this effect was largely blocked by 9-cis-RA. These effects of 9-cis-RA on coactivator binding to the preformed heterodimer contrast with the strong stimulatory effect observed with RXR alone, confirming the characterization of this complex. 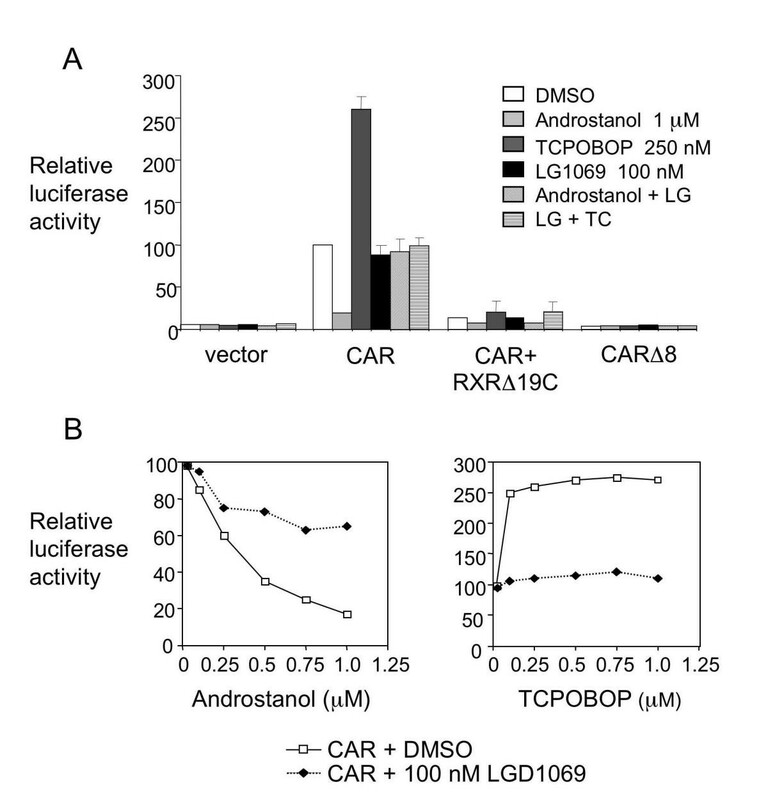 These results demonstrate that the presence of the RXR ligand can significantly alter the response of the CAR/RXR heterodimer to CAR ligands. 9-cis RA blocks effects of CAR ligands on coactivator binding in vitro. GST-SRC-3 fusion protein was immobilized on a flow cell and tested for interaction with receptors. A. Overlaid results of injections of apo-RXR and RXR preincubated in the presence of 9-cis RA. B. Overlaid results of injections of apo-CAR and CAR preincubated in the presence of TCPOBOP (TC) or androstanol (An). C. Overlaid results of injections of preformed CAR/RXR heterodimers preincubated in the presence or absence of 9-cis RA and TCPOBOP (TC) as indicated. D. Overlaid results of injections of preformed CAR/RXR heterodimers preincubated in the presence or absence of 9-cis RA and androstanol (An) as indicated. To examine the effects of RXR ligands on CAR transactivation in a more functional context, the rexinoid LG1069 was combined with the CAR inverse agonist androstanol and the agonist TCPOBOP in a series of transient transfection studies using different response elements. Initial studies were based on a well characterized binding site for CAR/RXR heterodimers, the DR-5 element from the promoter of the retinoic acid receptor β2 isoform [8, 9, 16]. In agreement with the biochemical results, the rexinoid blocked both the stimulatory effect of the agonist and the inhibitory effect of the inverse agonist on this element (Fig. 2A). In more detailed dose response studies, 100 nM LG1069 decreased the inhibitory effect of androstanol by as much as 70% and had an even stronger effect on TCPOBOP activation (Fig. 2B). Consistent with previous results , deletion of the helix 12 AF-2 motif of CAR eliminated both constitutive and ligand dependent transactivation. Deletion of the same motif in RXR also strongly decreased transactivation, but did not completely eliminate ligand responses (Fig. 2A). The RXR ligand LG_1069 blocks effects of CAR ligands. A. HepG2 cells were cotransfected with vectors expressing wild type CAR (CAR wt), a CAR AF-2 deletion mutant (CARΔ8) or an RXR AF-2 deletion mutant (RXRΔ19), together with a luciferase reporter containing the βRARE response element, in the presence or absence of androstanol, TCPOBOP and/or LG1069. Luciferase activity is relative to that directed by CAR alone (100%). B. A CAR expression vector was cotransfected into HepG2 cells with the βRARE-TK-Luc reporter construct in the presence of solvent (open squares) or 100 nM LG1069 (solid diamonds) and increasing amounts of either androstanol or TCPOBOP as indicated. Luciferase activity is relative to that in the absence of ligand (100%). To test whether the apparent allosteric effects of LG1069 on CAR transactivation vary with different response elements, the effect of the rexinoid on transactivation directed by cytochrome P450 response elements was examined. In contrast to the results with the DR-5 site, but in agreement with the biochemical results, LG1069 alone had a stimulatory effect on the ER-6 CAR response element from the promoter of the CYP3A4 gene (Fig. 3). This effect was not due to RXR homodimer function, since no transactivation was observed with RXR alone. In contrast to both the DR-5 and biochemical results, LG1069 did not block the stimulatory effect of TCPOBOP. Instead, the stimulatory effect of the two agonists was retained when they were combined. Combining LG1069 with the inverse agonist androstanol resulted in a partial block in its inhibitory effect and an intermediate level of activity. Similar results were observed with the tandem DR-4 sites from the CYP2B10 gene, except that LG1069 did not have a significant stimulatory effect on its own, but did augment the effect of TCPOBOP. It is interesting that these two CYP elements respond somewhat differently to RXR cotransfection, which increases responses directed by the CYP3A4 element but modestly decreases responses of the CYP2B10 element (data not shown). On both elements, similar results were observed when 9-cis RA was substituted for LG1069 (data not shown). These results show that the negative effects of rexinoids on TCPOBOP and androstanol signaling observed with the DR-5 site from the RARβ promoter are not observed with the DR-4 and ER-6 sites from the CYP promoters. Thus, the CAR/RXR heterodimer responds differently to retinoids on different elements. Rexinoid effects on CAR/RXR are dependent on response element. A. HepG2 cells were cotransfected with expression constructs for CAR and/or RXR together with a previously described luciferase construct containing a ER-6 type element from the, human CYP3A4 promoter  in the presence or absence of ligands. The luciferase activity presented above is relative to that directed by vector alone in the absence of ligands (100%). B. A similar transfection with a previously described reporter containing the tandem DR-4 elements from the mCYP2B10 gene . A previously described HepG2 derivative stably expressing mouse CAR  was used to determine the effects of RXR agonists on CAR function in the context of native chromatin. Expression of CYP2B6, a human relative of CYP2B10, is constitutively induced in this cell line. 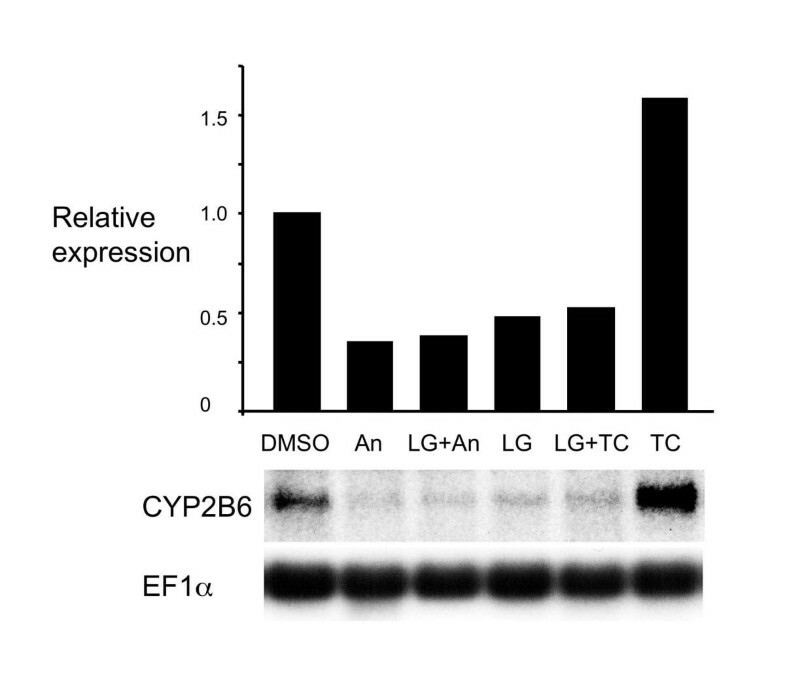 In contrast to the results with the transient transfections with the CYP response elements, CYP2B6 expression was decreased to a comparable extent by androstanol, LG1069, and the combination of both ligands. CYP2B6 expression was increased by TCPOBOP, as expected, and this response was blocked by LG1069 treatment. A number of RXR heterodimer complexes have been categorized as either permissive or non-permissive based on their responses to RXR ligands . Although there are some reported discrepancies, the PPAR, FXR and NGF-IB/NURR1 complexes are generally considered permissive, while the non-permissive group includes the RAR, TR and VDR complexes (see [2–7]). In the permissive complexes, coactivators can presumably bind to the AF-2 surface of both partners and binding to the RXR partner is stimulated by rexinoid agonists. This can result in distinct responses depending on which of the two partners is activated. In the case of the PPARγ/RXR complex, for example, activation with PPAR or RXR specific ligands results in recruitment of quite different coactivators . Among the non-permissive complexes, the RAR/RXR heterodimer is the best studied. Recent results suggest that the C-terminal helix 12 of RXR exerts allosteric effects on RAR function . However, additional studies suggest that corepressor binding to the apo-RAR component of the heterodimer blocks rexinoid induced binding of coactivators to RXR . These results suggest that the mechanisms that account for the lack of responsiveness of the non-permissive complexes are complex. As summarized in Fig. 5, the results described here demonstrate that the effects of RXR agonists on the CAR/RXR heterodimer can be quite different in different contexts. In vitro studies in the absence of DNA demonstrate that CAR/RXR heterodimers can be activated by an agonist ligand for either receptor. This positive response to 9-cis-RA contrasts with the inhibition that would result from the loss of RXR to ligand-dependent homodimers , confirming that these studies reflect the activity of CAR/RXR heterodimers and demonstrating that such complexes can be permissive for RXR signaling. Remarkably, however, coactivator binding is decreased in the presence of both of the activating ligands. Similarly, the inhibitory effect of the inverse agonist ligand androstanol on coactivator recruitment is blocked by 9-cis-RA. In transient transfections, the rexinoid LG1069 shows different effects on the ability of the xenobiotic receptor to transactivate various response elements. The rexinoid alone has no effect on transactivation of the βRARE, but strongly inhibits responses to both the agonist TCPOBOP and the inverse agonist androstanol. In contrast, LG1069 can stimulate transactivation of the response element from the CYP3A4 promoter. On that element it does not block the stimulatory effect of TCPOBOP, but decreases the inhibitory effect of the androstanol somewhat. On the tandem CYP2B10 elements, LG1069 does not have a stimulatory effect on its own and does not decrease the inhibitory effect of androstanol, but it does increase response to TCPOBOP. Finally, expression of the endogenous CYP2B6 gene in CAR expressing HepG2 cells is modestly inhibited by LG1069 alone, androstanol alone and the combination of both. In this context, the rexinoid blocks activation by the agonist TCPOBOP. These rexinoid responses share the general theme of inhibition of some of the effects of CAR ligands by RXR ligands, but are clearly quite disparate. The differences may be based on variations in experimental approach or on more fundamental functional differences. For example, it is possible that the inhibitory effect of LG1069 in the stable CAR expressing cell line is based on the sequestration of limiting amounts of RXR into ligand-dependent homodimers, as has been suggested in previous studies using primary hepatocytes . However, similar effects were observed with the relatively large amounts of RXR used for the biochemical studies or with the transient transfections, which relied on cotransfected RXR. It is also possible that differences in the chromatin context could contribute to the differences between the effects observed with the endogenous and transiently transfected promoters. However, such differences cannot account for the results with reporter plasmids that differ only in the identity of the response element. Overall, we conclude that binding of both the DNA and the RXR ligands can result in allosteric effects on the function of the CAR/RXR heterodimer. The disparities in these responses preclude a single, simple explanation for the effects of rexinoids on CAR/RXR heterodimers. Nonetheless, one attractive possibility is that binding of the RXR agonist exerts direct inhibitory effects on either the binding or functional effects of the CAR ligands. Some precedence for a significant allosteric effect of one heterodimer partner on another is provided by the inability of the insect ecdysone receptor to bind its steroid ligand in the absence of its heterodimer partner USP . The outcome of this inhibition of CAR ligand binding would be somewhat different depending on whether or not the RXR agonist was able to activate the basal transactivation of CAR/RXR heterodimer bound to a particular element. On the βRARE, for example, the RXR agonist might bind, but not increase transactivation beyond that observed in the absence of ligands. In this case, blocking TCPOBOP binding would strongly inhibit TCPOBOP-dependent transactivation. In the case of the CYP3A4 response element, however, activation by the RXR agonist is comparable to that observed with TCPOBOP alone. Thus, blocking TCPOBOP binding would not result in the net inhibitory effect observed with the βRARE, but could account for the lack of additive effect of the two ligands. A variety of factors complicate this relatively simple model, including the specific cytoplasmic to nuclear translocation that is required for CAR transactivation in the liver [22, 23]. Rexinoids by themselves are apparently unable to induce this translocation process in rat  or mouse (data not shown) hepatocytes and thus cannot directly activate CAR targets. More complex combinatorial effects of other coactivators or corepressors (e.g. [6, 7]) could also contribute to the observed responses. Recent results suggest that CAR can interact with NCoR or SMRT in the presence of inverse agonists , although such interactions appear much weaker than those of other receptors. Further characterization of potential CAR cofactors, as well as the development of sensitive and direct ligand binding assays will be required to define the molecular mechanisms that account for the diverse effects of rexinoids on CAR transactivation. Overall, we conclude that the disparate effects of rexinoids on CAR/RXR heterodimers in different contexts add significantly to the potential complexity of the effects of RXR ligands on such nuclear receptor heterodimers, and demonstrate that classifying a particular complex as permissive or non-permissive can be an oversimplification. The results described here also suggest that rexinoids may have modulatory effects on xenobiotic responses, and that such effects may differ for different CAR/RXR target genes. A systematic examination of the effects of RXR ligands and retinoid status on a number of the growing set of CAR target genes will be required to explore this possibility. The effect of ligands on coactivator binding was evaluated using the BIAcore instrument as described [25, 26]. For interaction of CAR, RXR and CAR/RXR heterodimer with SRC-3, a GST-SRC-3 fusion protein containing the receptor interaction domain of the coactivator was expressed in bacteria and purified. This fusion protein was immobilized in flow cells using anti-GST antibody. Lack of binding of free GST demonstrated that the surface was saturated with GST-SRC3. Purified CAR and RXR proteins were produced in bacteria and preincubated overnight at 4°C alone or in combination, and in the presence or absence of 10-5M androstanol, 10-6M TCPOBOP, 10-6M of 9 cis-RA, as appropriate. CAR alone, RXR alone, and CAR/RXR heterodimers bound to various ligands were injected individually into flow cells and binding was measured as described [25, 26]. The βRARE-TK-Luc reporter plasmid with three copies of the DR-5 motif from the promoter of the mouse RARβ2 gene has been described previously, as has the CYP2B10-TK-Luc reporter with two copies of the DR-4 type elements from the promoter of the mouse CYP2B10 gene and the CYP3A4-TK-luc reporter with three copies of the ER-6 element from the human CYP3A4 promoter . Expression vectors for full length mCAR and RXR proteins were as described . The cdm8-mCARΔ8 deletion construct containing a deletion of the last 8 amino acids and the mutant with 2 helix 3 mutations (F171L, I174A) that block ligand binding and response have been described previously , as has the cdm8-RXRΔ19 construct with a deletion of the last 19 amino acids . HepG2 cells were maintained in Dulbecco's modified Eagle medium (DMEM) supplemented with 10% fetal bovine serum (Hyclone). For transfections, 105 HepG2 cells were plated in 24 well dishes with DMEM supplemented with 10% charcoal stripped serum and transfected using the calcium phosphate precipitation method as described . The next morning, cells were washed with phosphate buffered saline and ligands were added. Typically, transfections included 100–200 ng of luciferase reporter plasmids, 100 ng of β-galactosidase (β-gal) internal control plasmid (CMV β-Gal), and 100 ng of cdm8 expression vectors. A total of 500 ng of plasmids was used per well. Cells were assayed for luciferase (Promega) activities 24 hours after addition of ligands and reporter expression was normalized to β-galactosidase activity (Tropix) according to the manufacturer's directions. Similar results were obtained from at least three independent experiments. Error bars are included for experiments where variations were more than 10%. A previously described derivative of HepG2 cells stably expressing mCAR  was used for RNA analysis. Cells were subcultured and incubated in DMEM supplemented with 10% charcoal stripped bovine serum overnight. Various ligands were added and total RNA was prepared 9 hours later and used for Northern blotting using standard procedures . Diverse effects of rexinoids on CAR/RXR activities. The effects of rexinoids on basal and CAR ligand dependent transactivation are summarized. Upward and downward arrows indicate stimulation and inhibition of coactivator binding or transcriptional effects. The rightward bar (----|) symbolizes a blockage of the effect of the CAR ligand by rexinoids (or decrease in the case of the repression of the CYP elements by androstanol); (-), no effect. We thank Dr. Rich Heyman for LG1069. This work was supported by NIH grant DK46546 to D. D. M.
I. T. and S. S. C. carried out the studies of CAR function in transiently transfected cells. S. S. C. carried out the studies of gene expression in stable CAR expressing cells. B. C. carried out the surface plasmon resonance studies. D. D. M. directed these studies. All authors read and approved the final manuscript.